The Captain's Locker offers a beautiful two bedroom non-smoking unit with a full kitchen. Our family-friendly lodgings will make you feel right at home on Cape Cod. The Lower Cape has open spaces and gorgeous beaches, where you can see the magnificent sunsets, and the breathtaking sunrises. This is the real Cape Cod! 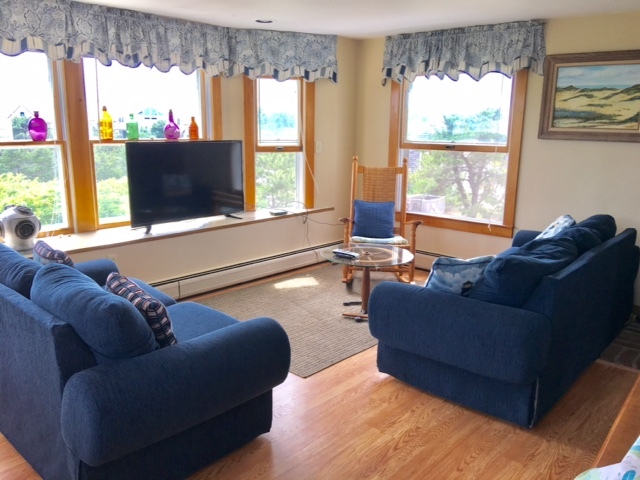 We are a walking distance to Cape Cod Bay and about a 5 minute drive to the ocean beach as well as National Seashore Beaches and other Truro Beaches. We are also close to the following enjoyable sights and attractions: bicycle trails, whale watching, golf, shops and restaurants, sport fishing, guided nature walks, bird-watching, sailing on a windjammer and kayaking. Our spacious two bedroom unit is designed with a fully equipped living room/kitchen area. The bedrooms are located off the living room/kitchen with a bathroom in between. One bedroom has a queen size bed and a dresser, and the other has two double beds. If you have another couple or children vacationing with you, there is enough space and privacy for you to enjoy. Our Captain's Locker features a fully-equipped kitchen. We provide bed linens, bath towels, dish towels,shower mats, pots & pans, silverware, dishes, coffee maker, toaster, microwave, color cable and a clock radio. We also provide the initial supply of garbage bags, dish washing liquid, one roll of paper towels, toilet paper and small soaps. The only items that we do not provide for you are your personal beach towels. Relax on the deck and watch the sunset. We make sure that all our guests have a quiet	and peaceful stay. Children are welcome. We take great pride in our hydrangea flowers. When the flowers are in season every guest that arrives for the week will find fresh flowers in their condos for that "Welcome Home" feeling.